Cloud Storage Gateway is a gateway service that can be deployed on your on-premises data center or in the cloud. 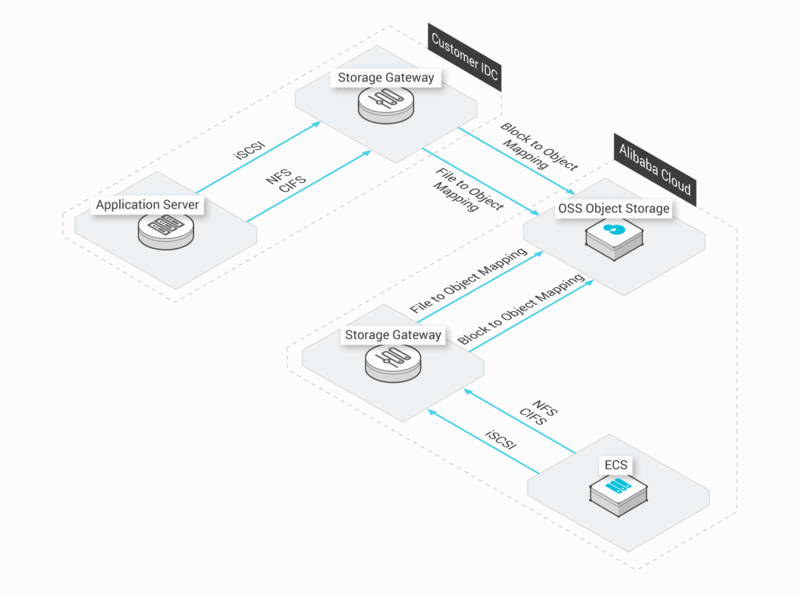 It uses Alibaba Cloud OSS as the backend storage to provide seamless, secure integration between your organization's internal IT environment and your cloud-based storage infrastructure. It supports industry-standard storage protocols (NFS/SMB/iSCSI) and provides low latency performance by caching frequently accessed data locally. You can securely store data in Alibaba Cloud OSS. You can deploy Cloud Storage Gateway in both local data centers and ECS instances in the cloud. Use Cloud Storage Gateway immediately with simple deployment that does not require code. You get Imput/Output (I/O) performance similar to a local disk coupled with the scalability of cloud storage. File protocols such as NFS and CIFS and iSCSI block protocols are all available and based on the same protocols in OSS. Cloud Storage Gateway offers local and flexible caching enabling you to smoothly synchronize data to the cloud. Multi-threading and asynchronous operations enable high input/output performance. Cloud Storage Gateway supports both cache and system write through modes. You can save data in the local cache or directly to the cloud. In cache mode, your data is automatically stored in a local storage tiers or cloud tiers based on the data usage frequency. Cloud Storage Gateway supports NFS, CIFS, and iSCSI storage protocols. It also supports various deployment models, including deploy the gateway in ECS instances, Hyper-V, Kernel Virtual Machine (KVM), and VMware virtual machines. Cloud Storage Gateway supports to be deployed on a virtual machine using VMware, VHD, Qcow2, and Raw virtual machine images. It can also be deployed on ECS instances. Cloud Storage Gateway supports the NFS, CIFS, and iSCSI storage protocols. It is fully adapted to both Windows and Linux. Cloud Storage Gateway synchronizes data using multi-threading with asynchronous pattern operations, and provides an automatic consistency check. Cloud Storage Gateway supports data synchronization using multi-threading and asynchronous pattern operations to enable broken-point continuously-transferring. Cloud Storage Gateway automatically ensures data consistency based on the MD5 algorithm. Cloud Storage Gateway provides full logs and monitoring metrics to record all activities between the storage gateway and the cloud. Cloud Storage Gateway logs all activities between the storage gateway and Object Storage Service (OSS). You can obtain the benefits of high scalability and low cost storage by smoothly connecting current storage system to the cloud without needing to change the existing architecture. You can establish a storage system with high capacity and high scalability at a low cost by using your existing facilities and Alibaba Cloud OSS. You can have the I/O performance similar to the performance that you have when accessing a local disk with the storage capacity of the cloud. Cloud Storage Gateway is compatible with local storage service protocols. Supports for the NFS and SMB file protocols and simultaneously attaching OSS disks to multiple ECS instances enable reliable and cost-effective access to OSS buckets. You can use various OSS storage types. It allows you to easily have a disaster recovery system in the cloud by integrating Cloud Storage Gateway with NAS and ECS in the cloud. We recommend that you integrate these services.